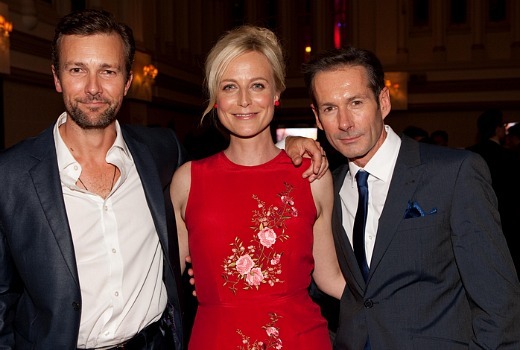 Last night the stars of A Place to Call Home joined with creators, execs and media in Sydney for the Seven drama’s official launch. They gathered at The Tea Room at the Queen Victoria Building. In attendance were (top L to R) Arianwen Parkes-Lockwood, David Berry, Abby Earl and Aldo Mignone plus stars Noni Hazlehurst, Frankie J. Holden and (below L to R) Craig Hall, Marta Dusseldorp and Brett Climo. Seven was represented by Chairman Kerry Stokes, Head of Production Brad Lyons, Head of Programming Angus Ross, Drama Execs John Holmes and creator Bevan Lee. Lee said he developed the idea after completing his “domestic trilogy” of Always Greener, Packed to the Rafters and Winners and Losers. “I went to the past because I wanted to go to a time that was relevant to now. I think what’s relevant is that in the 60 years between 1953 and now is that we’ve lost things and we’ve gained things. “And whatever story we tell, let me tell you this, the story is nothing if not a ripping yarn. It rattles along. “The thing I think we’ve lost in Australian storytelling, is the interesting question: What Happens Next? A Place to Call Home is coming soon to Seven. Really looking forward to this as it was made in the area I live, beautiful country side, look forward to seeing fresh faces as well as some established actors and actresses and the story line looks very intriguing, hope it is a Hugh success, great to see a new Ozzie drama. i have heard that it has since been confirmed for Sundays. but i agree with other commenters. so many articles and reviews are very positive for the show, then we get to the end and it says ‘coming soon’ such a great promotional opportunity missed, if a timeslot was announced earlier people would pencil it in asap. surely that outweighs the negatives of keeping their cards close to their chest. Seven are advertising next week as the Grand Final week of MKR, so I predict A Place to Call Home to premiere on Sunday April 28 after the Grand Final of MKR. Sounded great when I first saw the ads, now I am slowly ‘getting over it’. If Ch 7 does not start this series soon, I will be totally over it before it even starts. It is clearly going into the Downton timeslot, which is the perfect place for it. . Why dont they just announce that? Sounds good, really looking forward to this. But so far ads say ‘coming soon’. How I am coming to hate that phrase. Things are coming soon for 6 months. I mean Parenthood finished last week which gave them 2 hours after Rafters, so what do they do? They put a movie on. I mean WTF?